Posted October 12th, 2017 by Adam & filed under Special Event. Recently, we celebrated the wedding of my oldest son and his girlfriend, both members in our community. I was privileged to give this homily on that wonderful day. Trier, Germany, a city with an ancient history is situated on the banks of the Moselle river in the important Moselle wine region and is located near the border of Luxembourg. A tourist city that Emperor Constantine called his summer home, it may be the oldest city in Germany. It’s here that Karl Marx was born and during World War II it became the staging area for British soldiers captured at Dunkirk to be sent to prisoner-of-war camps. As you can imagine, Trier has a lot of history to attract tourists. But like other ancient cities, it wasn’t designed to accommodate modern vehicles. So, in the fall of 1993 an underground parking lot was being excavated to meet this challenge. As a random excavator clawed into the earth he inadvertently ripped apart a bronze cauldron filled with the largest Roman gold horde ever found. The treasure had been buried under a basement of a local house since about 196 AD. The horde consists of over 2500 gold coins, some minted as early as 63 AD. The value of the horde is priceless. For two millennia think how many people lived right on top of that horde, storing worthless junk in their basement only inches away from one of the great treasures of the world. How can it be that something so valuable can be hidden from so many people for so long? Together, they have metaphorically discovered a horde of gold that changes everything, and surely their future is bright. As the impressive clergyman said, “Marriage, is what brings us together, today.” We are gathered here to witness something sacred, the marriage of Timothy Chester Krell and Catherine Rose Stearns. The pomp and circumstance of this setting, the detailed planning that went into it, the great distances travelled, and the solemnity of our gathering all speak of something sacred going on here. But what do we mean by sacred? Perhaps we mean something like the gold horde hidden away beneath a day-to-day storage area. Something of unthinkable value that has potential to turn the mundane into the extraordinary. 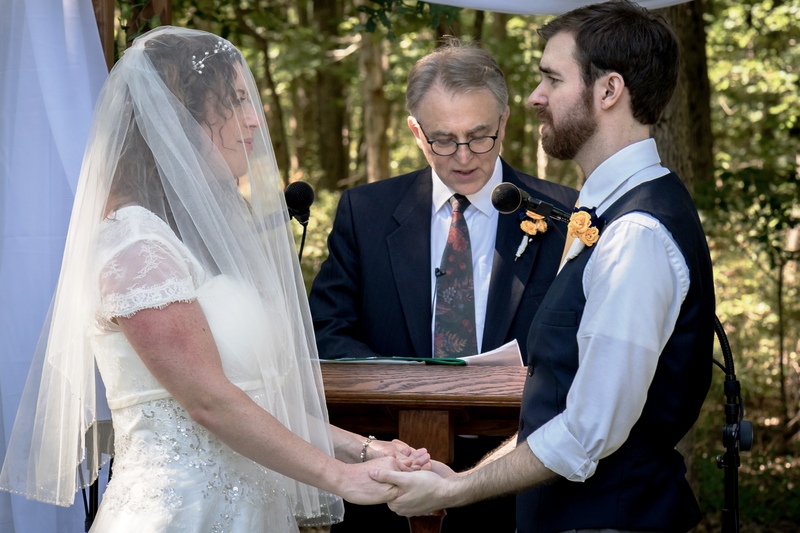 The sacred is, to quote Roger Scruton, “something precious and mysterious, which reaches out to us with a claim that is in some way not of this world.” That is what marriage is. Something precious and mysterious that has its origin and power from somewhere not of this world. Sacred things inspire awe in us. They make us walk a little slower, speak a little softer. We respond with a solemn face and an inner reverence. We recognize something uncommon is here, something important. When we visited the museum that showcased the Trier gold horde in Germany, there was an almost church-like atmosphere in the display room. You felt compelled to speak in hushed tones and stealthily move around the room. What we’re doing here today carries that same sense of reverence, but with it also a sense of excitement and anticipation. One of the reasons we can sense these things is because of the lives Timothy and Catherine have lived. They have approached their relationship from the beginning as something greater than themselves and by the call of Someone greater than themselves. They have metaphorically been climbing a sacred hill towards a summit where they will meet with the Divine. That day has finally come. And we here are witnesses of that event. Some couples are able to maintain this sacred quality to their marriage even fifty years on. They do it by walking together in a divine procession through the mundane activities of daily life. They may be stacking boxes of old clothes in the basement, but they are fully aware that just beneath their feet lies a gleaming treasure of infinite worth. They listen to each other, they admit their mistakes, they sacrifice for each other, and they keep themselves pure for one another. They dwell at the summit of the sacred hill. Other couples desecrate their relationship. They take each other for granted, they hold on to bitter resentments, they recognize no authority higher than themselves, and ultimately they seek to use each other as they assert their rights, and grudgingly perform their duties. Like the rebellious Cypher in the movie The Matrix, they jump on the sleeping Morpheus, mock and heap contempt on him, angry about imagined slights and petty grievances. They know of no sacred hill and because of that ignorance they are unaware of the treasure that sits at the foundation of their home. Timothy and Catherine are making their home with Christ. They have chosen to live in the glow of the divine light among fellow followers of the Risen Savior. Their relationship bears the mark of the sacred and because of that, today they claw through and rip open a vast treasure that will sustain and enrich them all the days of their life. Timothy and Catherine, treasure your relationship. Seek God first. Make Him the center of your family. Reach out to others whom you respect and love to help you in this sacred calling. Proclaim the beauty of Christ through your marriage. Friends and family, support Timothy and Catherine in their marriage. Never undercut either one no matter what they may face or the struggles they may endure. Don’t take sides. Strengthen their marriage and help them stay true to their vows. Be a faithful friend to them as a couple. Cheer them on. Pray for them. Timothy and Catherine, may the grace of God always surround you, enriching your lives and nurturing your love, seasoning your words and shaping your actions, uniting you in times of trial, supporting you in moments of sorrow, and bringing you lasting joy and enduring fulfillment. May the Lord be with you, his hands below, his arms around, and his Spirit within you, and may he lead you this and every day, as you travel together along life’s checkered path.